This species is wide-ranging in North America and is considered stable throughout much of its range, with few exceptions. It is distributed in the Mississippi River system from Pennsylvania and Tennessee west to Minnesota and Colorado; St. Lawrence River system and the Great Lakes (Burch, 1975). In Canada, this species has several secure populations in Manitoba and Ontario and likely Saskatchewan, fewer populations in Quebec, and occurs in Alberta but status unknown. Comments: This mussel has a straw-colored, thin shell with a smooth and shiny exterior. Young shells reveal fine V-ridges on the umbo. The nacre is white. 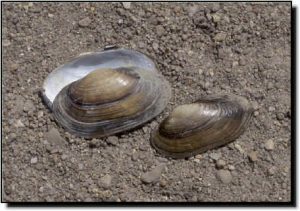 While most of the mussels in Kansas are found in the southeastern part of the state, the cylindrical papershell’s range was across the northern half of Kansas. Relic shells have been found in the Kansas, Saline, Nemaha and Blue rivers. Currently, the only remaining population exists in a short stretch of the Smoky Hill River. 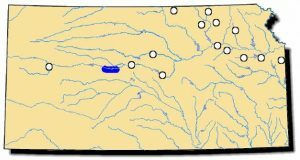 Low to nonexistent stream flow rates threaten the remaining population in Kansas.